In Sweden the importance of the Eurovision Song Contest might be higher than anywhere else. Thanks to ABBA and “Waterloo” in 1974, the event and the style of music has enthused the whole world. The Swedish music industry is quite a big number worldwide. There are heaps of sound studios especially in Stockholm and many popular singers are being produced in Sweden. Therefore the interest in the Swedish music has grown a lot over the years. The Melodifestivalen is the national Swedish event to choose the Eurovision Song and is very popular and has the highest viewing figures of all programs in the Swedish TV. It’s called the “Swedish Schlager”, which is a very popular music genre in Scandinavia. Almost all of the 32 songs are found in the charts and played all year around in the radio stations, discos and parties. It’s a kind of national event, when Sweden decides in six shows, who will represent their country in Eurovision. The national final always takes place in the Globe arena in Stockholm. 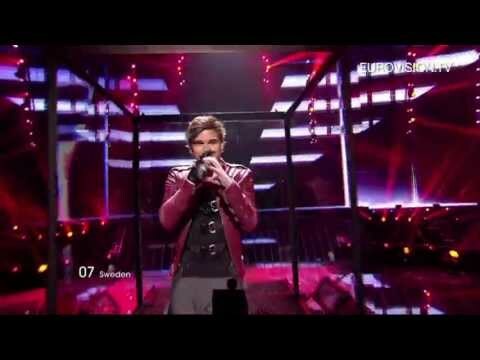 This year’s song for Sweden is called “Popular” sung by Eric Saade, who came 2nd last year. The composer is Fredrik Kempe, who has written “Hero” for Charlotte Perelli and also co-wrote “My heart is yours” for Didrik for Norway last year. Fredrik Kempe had several songs in the Melodifestivalen and this happens almost every year! Eric Saade is a 20-years-old young singer, born in Helsingborg, Southern Sweden with no attitudes. He is very popular in Sweden already, he was the clear favorite of the national final. The song is a modern pop song, with a catchy melody. The stage performance is very well choreographed, Eric is also a very good dancer as well. On stage they used to have huge glass panes, which were destroyed by Eric at the end of the song. Due to the fact that there are too many bits of broken glass on stage, this utensil cannot be taken on the stage in Düsseldorf. This year Sweden must qualify for the final, as last year “This is my life” by Anna Bergendahl did not pass the semi final, the Swedes were very disappointed. Let’s cross the fingers that Sweden is going to pass the semi final this year.